Please join the Hanson Park Conservancy on Tuesday, April 23rd at 7:00 PM as we welcome Marta McDowell, author of The World of Laura Ingalls Wilder: The Frontier Landscapes that Inspired the Little House Books at the Cranford Community Center. Garden historian, Marta McDowell will take us on an entertaining journey with the beloved Little House series as we explore Wilder’s deep relationship to the landscape. Throughout, you’ll learn details about Wilder’s life and inspirations, discover how to visit the real places today, and even learn to grow the plants and vegetables featured in the stories. The plants, animals, and landscapes are so integral to the stories, they are practically their own characters. It is a world of prairie, forest, farm and garden. Join us as we explore the natural history, places, and plants of this beloved American children’s author. Marta McDowell lives, writes and gardens in Chatham, NJ. She teaches landscape history and horticulture at the New York Botanical Garden and has worked as a horticulturist at Reeves-Reed Arboretum in Summit. She has been a featured speaker at locations ranging from the Arnold Arboretum to the Philadelphia Flower Show. She also wrote All the Presidents’ Gardens, a New York Times bestseller, and Beatrix Potter’s Gardening Life. McDowell’s garden is included in the Smithsonian’s Archive of American Gardens. 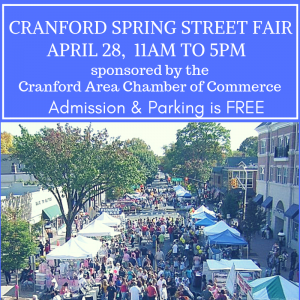 The Cranford Community Center is located at 220 Walnut Ave. in Cranford, NJ. McDowell will have copies of her book available for purchase and signing. Cash or check only. This event is sponsored by the Hanson Park Conservancy. The program is free and open to the public. No registration is required, but seating is available on a first-come, first-serve basis. For more information please go to our website www.hansonparkconservancy.com. This history program is made possible in part by a HEART (History, Education, Arts Reaching Thousands) Grant from the Union County Board of Chosen Freeholders. New Vision Theatres and Downtown Cranford invite you to join us every Saturday in April at 11 a.m. for our Spring Movie Series. Tickets are $8 for Adults and $ for children. In the summer of 1962, a new kid in town is taken under the wing of a young baseball prodigy and his rowdy team, resulting in many adventures. Family man Phil Weston, a lifelong victim of his father’s competitive nature, takes on the coaching duties of a kids’ soccer team, and soon finds that he’s also taking on his father’s dysfunctional way of relating. An aging, down-on-his-luck ex-minor leaguer coaches a team of misfits in an ultra-competitive California little league. Two sisters join the first female professional baseball league and struggle to help it succeed amidst their own growing rivalry. Thank you also to That Suburban Life from Lindsay Lehault Real Estate for sponsoring the series! Please join us on Sunday, April 28, 2019, at 2:00 pm at the Hanson House, 38 Springfield Avenue, for an afternoon of medieval music. A marvelous player of the harp, Michele has been entertaining people for over 30 years on both the East and West Coasts at events ranging from weddings to historical reenactments. For our program, she will be dressed in a medieval costume and will play music from the period. To help us to understand the music, she will stop occasionally to talk about the composers and the times. Michele has made two full-length, independent CDs. This program is free and all are welcome.